The BHU UET Exam Notification states that the university was founded in 1916 by Pandit Madan Mohan Lal Malaviyaji and that the university is the largest in Asia among resident universities. The notification of BHU UET Exam Notification 2018 states that for the admissions of 2018, the University is going to conduct its entrance test called the undergraduate entrance test or UET for admission to its three year and five year law program. This UET Entrance Test 2018 will be conducted anytime between second of April to second week of June 2018. The notification also states that the admissions will be granted solely on the basis of merit and provided that the candidates fulfill the eligibility criteria and the seats are available and the candidate has appeared for the entrance test. The notification also states that the online application forms must be filled in between January 2018 to March 2018. However, these are tentative dates and might be subject to change. The university invites applications through the exam portal which can be found on the website bhuonline.in. The whole application process takes place online. First one has to register on the online portal and then fill the form in the online mode only. The procedure is provided on the portal. The university also uploads the exam syllabus on the official portal once the exam date is near. 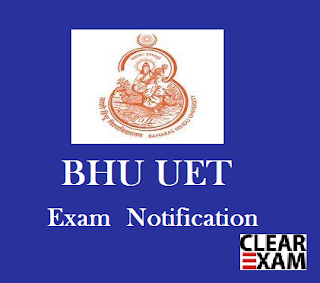 The BHU UET Exam Notification also says that the students who clear the exam and have obtained a rank in the merit list will be getting an electronic call from the university and these candidates must visit the online portal again, and login on the section which says candidate's segment. There these candidates will find an option to download the call letter. These selected candidates will also get an email and a SMS on their registered email address and phone number so students are advised to provide a valid email id and phone number which will be used for all future correspondance. No call letter will be sent to the candidates offline. The BHU UET 2018 notification states that the exam will be conducted in the offline and pen paper mode across various destinations. The names of these cities which are exam centres will also be provided in the notification. The notification document also talks about if there is a reservation for a particular category such as SC and ST candidates and for OBC candidates or sports quota people or students who are physically challenged and how much reservation is there for different categories. Read the notification properly for details about how you can benefit from the reservation and which are the certificates that you need to provide for availing the benefit of the reservation. For any doubts related to application procedure or structure of question paper you can once again go through the notification. You can also access the notification for details on method of answering the test. The notification document is full of little tips for the candidates for instance the notification says that every candidate should check the question paper to see all questions are present and no error in the question paper exists and the same should be done within the first 10 minutes of the paper. Read the notification once or twice properly to make sure you have your concepts clear about the application process, eligibility, syllabus, exam day guidelines, answer key release , results and counseling. Last but not the least what happens when you go through the notification is that you get to know the legacy of the university, the infrastructure, and facilities which you will be provided to you in case you make it to the university after getting a merit rank.